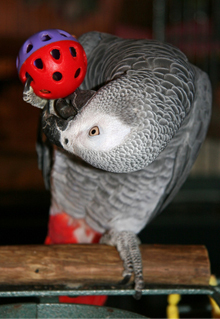 Providing birds with safe toys to play with and scheduling structured playtime keeps birds engaged, happy and healthy. Regular exercise can reduce stress, which helps maintain a healthy immune system, thus reducing a bird's risk for disease. Owners who regularly play with their birds develop stronger bonds and improve their ability to communicate with them. Games and toys also provide birds with the mental stimulation necessary to combat boredom. Caged birds crave the stimulation available in these activities. While many different toys exist to keep birds occupied, including mirrors, ropes, swings and foraging toys, it is not enough for an owner to choose just any bird cages for sale to house these accessories. Birds will need enough room for their daily eating and sleeping rituals, hanging space for their toys and also ample room to engage with these toys. (More specific instructions on how to choose bird toys are available in this article. ) Some bird cages for sale don't have enough room to begin with, and filling them with toys will overcrowd the cage and stress the bird. Owners should understand that bigger is better for birds and find bird cages for sale that will provide a healthy environment that encourages movement and play. Toss a soft ball near the bird and encourage him to retrieve it for you. If your bird doesn't want to return the ball, he still may enjoy picking it up after you toss it. Hide bird treats or toys around the house in rooms your bird is allowed in. Sing to your bird and teach him to sing to you. Begin imitating the movements of your bird and see if you can get him to eventually imitate you. Share in the destruction of a paper, tissue or anything else your bird likes to tear apart. Play hide-and-seek with your bird. Put him somewhere in a room and then hurry to hide out of his sight. Call his name if he is having difficulty finding you. Find another person with whom the bird is familiar, position that person at the top of a stairway and you at the bottom, then encourage your bird to climb and then descend a staircase. You can use his favorite toys or a treat to entice him to complete the exercise. When a bird drops a toy, respond with "Uh oh!" and then pick it back up. Sometimes birds will drop toys on purpose because they want their owners to come pick them up and interact with them. Turn on some music and dance in front of your bird (with simple movements), encouraging him to imitate you. Owners need to socialize with their birds and should make a daily effort to play games or spend time with their birds outside of their cages. Additionally, owners can make sure they find bird cages for sale with enough room for active play, such as any of those available at bird-cage.com. The BIG 3 Bird Play Links! Birds need structured playtime to maintain their health, and bird owners have an obligation to provide them with these opportunities. This African Grey is obviously enjoying a little out of cage activity and is getting quite adept at his "ball handling" technique. Many bird cages for sale aren't large enough to support the regular playtime needs of their occupants. 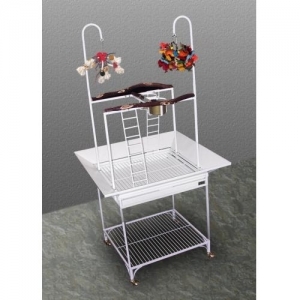 Play stands like the one pictured above offer additional stimulation for birds during their time outside of their cages.